The Washington Research Library Consortium was founded in 1987 as a non-profit corporation under the provisions of section 501(c)(3) of the Internal Revenue Code. The WRLC is operated exclusively for the benefit of other non-profit institutions of higher learning by promoting the development of a cooperative network among libraries in the Washington metropolitan area and by providing services to enhance library and information resources. The Board of Directors has the fiduciary, legal and strategic responsibility for the WRLC. The Board typically meets quarterly. The corporate officer who has responsibility for the library, typically the Provost or Chief Information Officer. The chief financial officer with responsibility for the main campus for those universities that are Sustaining Members. One non-voting Director, who is a Library Director of a participating institution and elected to be the chair of the Library Directors Council. An Executive Committee which may exercise the full authority of the Board between meetings of the Board. A Finance Committee to (1) review the budget prior to it being submitted to the Participants and the Board of Directors for their review, (2) review the budgetary expenditures from time to time during the year, and (3) review the results of the audit reports. A Library Directors Council to provide counsel on matters of programs, operations, policy, budgets, standards, rules, committee appointments, and other matters of import to the work of the WRLC and the individual libraries. A Council of Presidents to provide counsel on matters of strategic planning and other matters of import to the work of the WRLC and the Participants. The members of the committee shall be the Presidents of the participating universities. The Board of Directors may designate other committees, each consisting of two or more directors, as necessary. The Board of Directors may employ an Executive Director to direct and manage the operations of the Consortium. The Executive Director prepares plans and presents recommendations to the Board, coordinates the activities of the Consortium and directs the employees of the WRLC charged with carrying out the work of the Consortium. The Library Directors Council includes the library director of each of the partner universities in the Washington Research Library Consortium. The Council has programmatic responsibility for the Consortium, including reviewing and recommending budgets to the Board, establishing the annual initiatives, setting priorities and overseeing the implementation of programs. 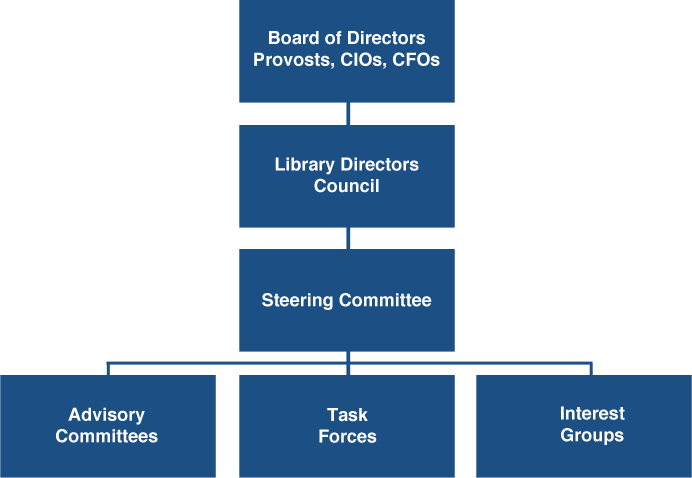 The Library Directors Council has established a Steering Committee to play the leadership role in developing and recommending the strategic plan and major initiatives for the Consortium; implementing those strategic goals as set by the Library Directors Council; and directing and overseeing the work of the Advisory Committees. Prepares and proposes to the Library Directors Council annually an updated strategic plan and a list of major initiatives to be pursued. Establishes task forces as appropriate to accomplish assignments. Makes recommendations to the Library Directors Council on policy, practice, programs, and services. Directs and coordinates the work of the standing committees, including evaluation of initiatives and projects suggested by the standing committees. Monitors and evaluates progress on approved initiatives and projects. Identifies new areas for collaboration. The work of the Steering Committee is coordinated by Co-Chairs who are elected by the Steering Committee. The Steering Committee appoints standing Advisory Committees, temporary task forces and Sharing Communities/Interest groups to facilitate communication and the work of the Consortium. Membership typically, though not universally, includes a representative from each of the partner universities. Each advisory committee includes a Steering Committee representative who acts as a liaison between the advisory committee and the Steering Committee.